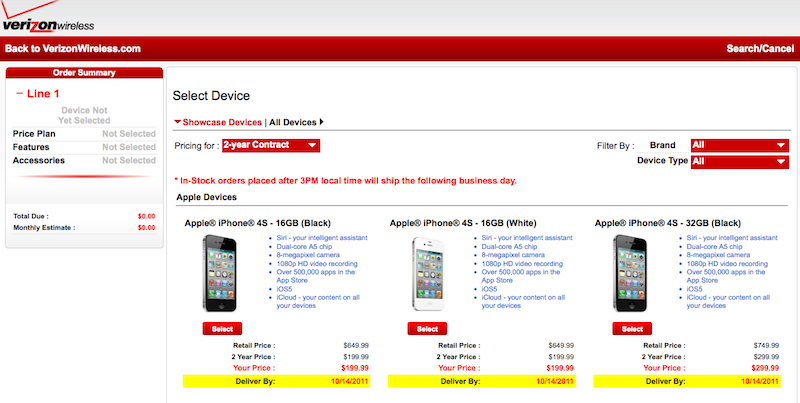 Apple and select partners began taking pre-orders of its new iPhone 4S smartphone early Friday ahead of its October 14th launch date, though some outlets, including Apple's own online store, ran behind schedule [updated]. The Cupertino, Calif., iPhone maker initiated advance sales of the iPhone 4S early Friday, slightly later than originally promised. For those unsure whether they are eligible for an upgrade, Apple offers customers the ability to check eligibility with its three wireless carrier partners in the U.S.
Verizon, Sprint and AT&T began offering pre-orders on their websites on Friday. Vodafone in the U.K. has also started pre-orders of the handset. The 16GB, 32GB and 64GB iPhone 4S models sell for $199, $299 and $399, respectively, with a 2-year contract in the U.S.
Update: Even after preorders began, online orders from Apple and its carrier partners struggled with user demand. 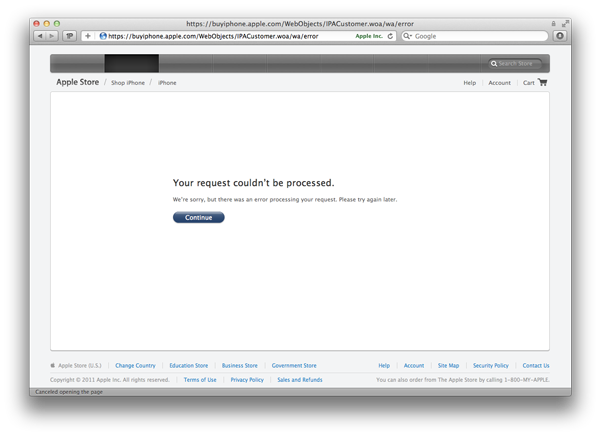 Apple's website at times showed errors stating that the site was not taking orders, though the process improved by later Friday morning. The new handset will launch on Oct. 14 in the U.S., Australia, Canada, France, Germany, Japan, and the U.K. Customers will be able to purchase the device from the Apple Online Store, Apple's retail stores, select Apple Authorized Resellers and participating wireless operators. Apple is pursuing its fastest international roll-out ever for the iPhone. Following the initial roll-out, the new handset will arrive in 22 more countries later this month. The company expects to sell the device in 70 countries on 100 carriers by the end of 2011. 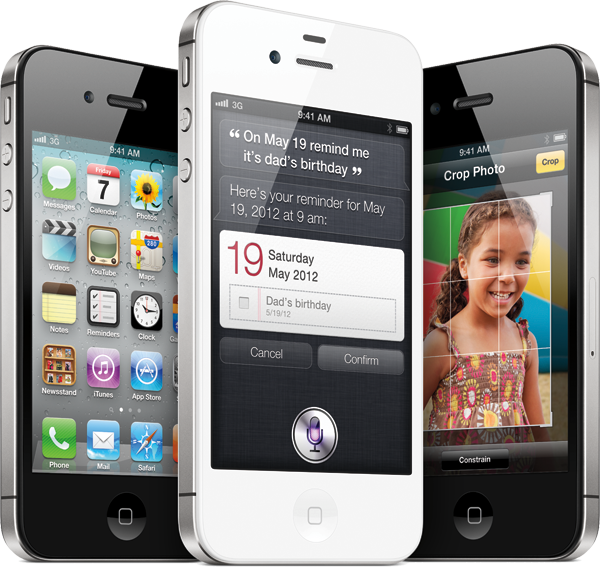 The iPhone 4S was unveiled at an Apple media event on Tuesday. The handset features the same external design as the iPhone 4, while sporting improved internals, such as the A5 processor, a 8-megapixel camera and a re-designed antenna. Apple is also touting the Siri voice assistant feature available exclusively on the new smartphone. According to All Things D's Ina Fried, Apple plans to offer an unlocked version of the iPhone 4S, though the company has yet to announce pricing. However, Apple warns in the fine print on its website that CDMA functionality is only available on the handset if it is "sold and activated for use on a CDMA network." Apple will likely have bolstered its servers in preparation for crushing pre-order demand. Last year, the company experienced a meltdown with its online store and phone lines due to overwhelming customer interest in pre-ordering the iPhone 4. Total pre-order sales are expected to outstrip last year's record, given that 16 months have passed since the iPhone 4 was released and Sprint and Verizon are generally believed to have pent up demand among their subscribers. Though Verizon began selling the iPhone 4 in February, recent surveys have suggested that many of the carrier's subscribers have been waiting for the release of a new iPhone. Analyst Brian White with Ticonderoga Securities believes the fifth-generation iPhone will "shatter" sales records set by the iPhone 4 last year.